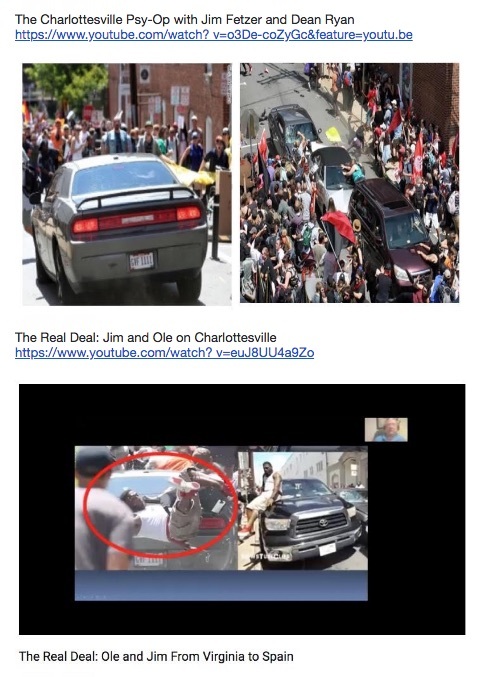 Stunned to discover that James Fields has been placed on trial and that the judge has allowed a photoshopped image to be introduced as evidence, I have written to the Commonwealth’s Attorney for Charlottesville, the Clerk of the Court, the Office of the Attorney General of Virginia and other worthies in the hope that this grotesque miscarriage of justice might be averted. I no longer have any confidence in our alleged “system of justice”. The situation here is completely obscene. James Fields was the patsy in a cleverly contrived political stunt. I have written repeatedly to the President of the University of Virginia, the faculty of the Department of History and to members of the City Council adducing proof that the events in Charlottesville were a charade, which was organized by the Mayor, the Governor and DNC officials and supporters, it appears, to promote their political agenda. Here is an article that lays out the basic evidence in this case. I have been simply dumbfounded that no one at UVA, where I myself taught twice (from 1977-78 and Spring. 1984-85), has shown the least interest. I would be glad to serve as an expert witness to exonerate James Fields from accusations leveled against him. The case is absurd with two cars, two drivers and two (or more) crash scenarios. If I and my colleagues can sort this out, surely the Commonwealth’s Attorney can put the pieces together–and ought to have done so long before this man was put on trial. He is being exploited for political purposes. Kindly address the evidence we have published and take corrective action for the sake of truth and justice. My faith in UVA, Charlottesville and our alleged system of justice are severely shaken. 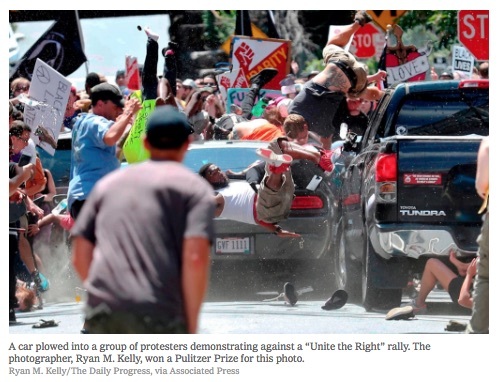 The New York Times (20 May 2018), has published a classic “feel good” story about a man who, we have been told, heroically saved a woman’s life in Charlottesville, VA, where he was tossed into the air after being struck by a Dodge Challenger driven by James Alex Fields during the right-wing rally on 12 August 2017. It makes a great story, but unfortunately none of it is true–which means that our official newspaper of record, widely assumed to record the history of the United States, has yet again fallen victim to “fake news”, one more reflection of the dismal state of journalism in the nation today. 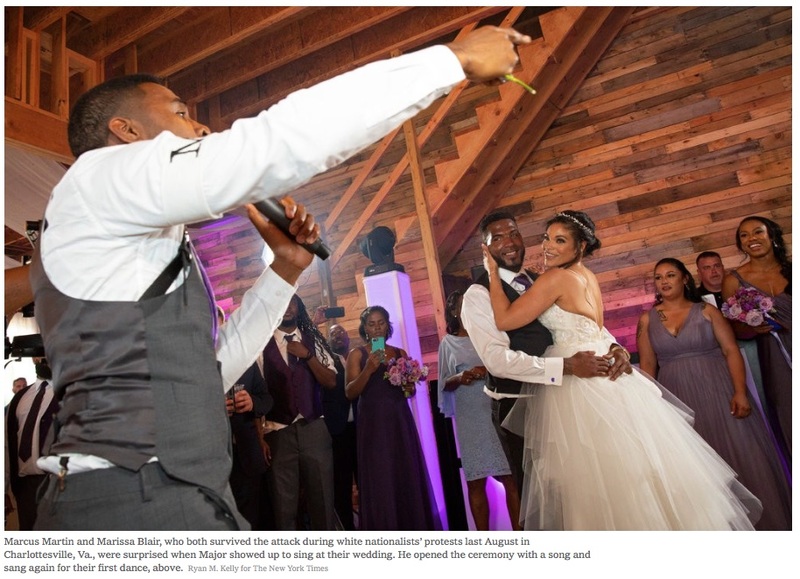 Here are the key paragraphs of the story of love and marriage between Marcus Martin, widely heralded among the heroes of Charlottesville, and Marissa Blair, whom he is reported to have pushed out of the way and thereby saved her life, but where, according to The Times, to hear him tell it, “she had already saved mine!”The problems here are several, including that James Alex Fields was not driving the car, but more importantly that this even included two cars, two drivers and at least two takes–it was a fabricated, staged event–and the photo awarded the Pulitzer was Photoshopped! 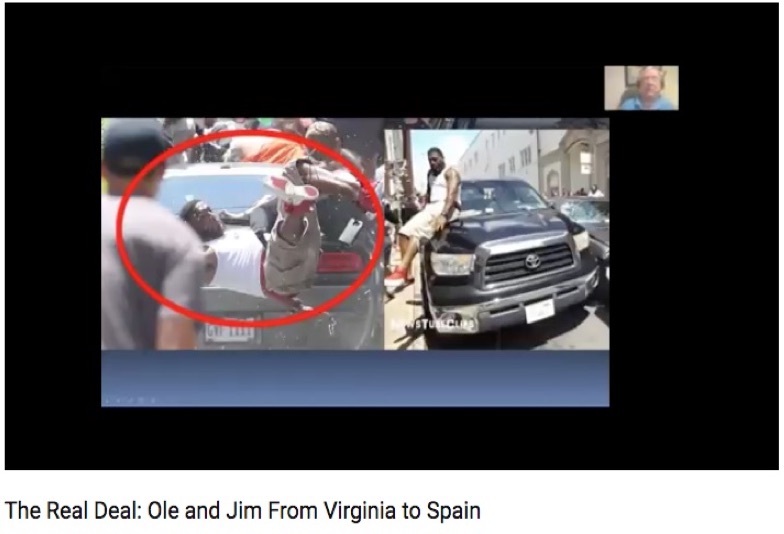 Which means that the video journalists who created these studies are more accurate in their reporting about Charlottesville than The New York Times! 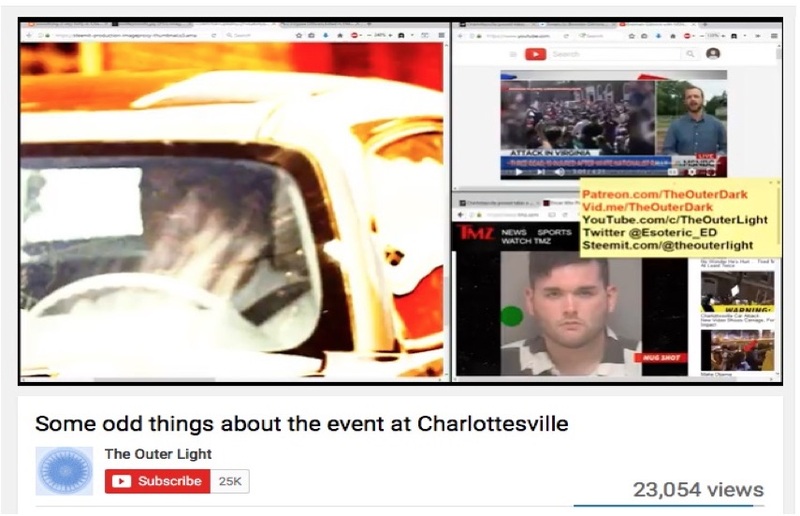 Anyone aware of the massive assault upon the public’s right to publish and share their research–which has assumed unprecedented proportions in scope and frequency to suppress information that exposes deceit and deception by the Deep State–will not be surprised that “Some odd things about the event in Charlottesville” is no longer available (but appears to be still on-line under a different name) but that “Charlottesville False Flag Theory–Something strange is going on” appears to have completely disappeared. Notice the absence of the black Toyota pick-up from this version, which we can call “Take #2”. Thus, if there had been a real crash as the basis for the prize winner, it would have to qualify as “Take #3”. All of these images were readily available before YouTube began taking them down. 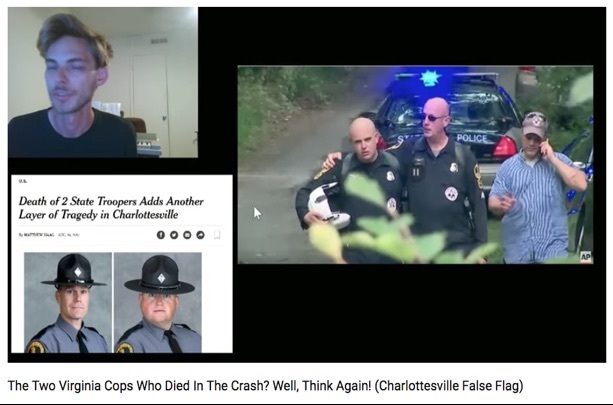 Check out the fate of “Charlottesville False Flag Theory: Something strange is going on”, “The Charlottesville Psy-Op with Jim Fetzer and Dean Ryan”, and “The Real Deal: Jim and Ole on Charlottesville“. Perhaps I am especially incensed by the corruption of The New York Times–where it’s either too incompetent to be publishing on Charlottesville at all or complicit in the deception–which might be the alternative explanation. I even wrote to the UVA Department of History and the UVA Administration about this. On 19 August 2017, having published these discoveries on my blog and several other places, I wrote to more than 85 members of the Department of History at UVA, assuming–mistakenly, it appears–that they would care about the accuracy of reporting about events in the city in which Mr. Jefferson’s University is situated. 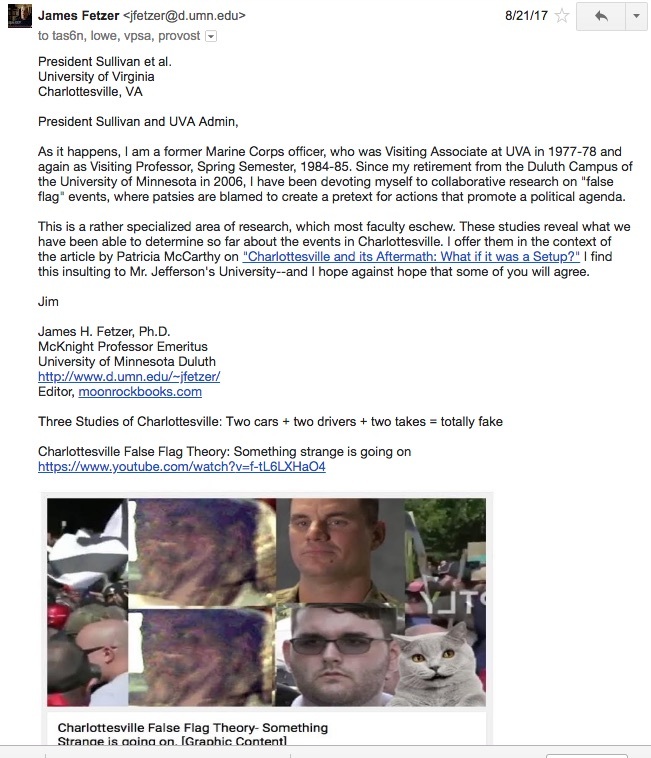 I heard back from exactly one, Grace Elizabeth Hale, Commonwealth Chair of American Studies and History, University of Virginia, who wrote, “Dear Jim, I am embarrassed to hear you have any connection with this university. Do not send me any more email. Grace Hale”. Undeterred, I continued to write to UVA’s student newspaper staff, The Daily Cavalier (19 August 2017), to the President, the Provost and the Vice-Provost (21 August 2017), to the Charlottesville City Council (24 August 2017), and to several individual members, including Kathy Galvin, Wes Bellamy, Kristin Szakos and Bob Fenwick (all 24 August 2017), where Bob initially showed some interest but would decline to pursue it. All of these letters had the same format and content, which this one to the President, the Provost and the Vice-Provost of the University of Virginia exemplifies. 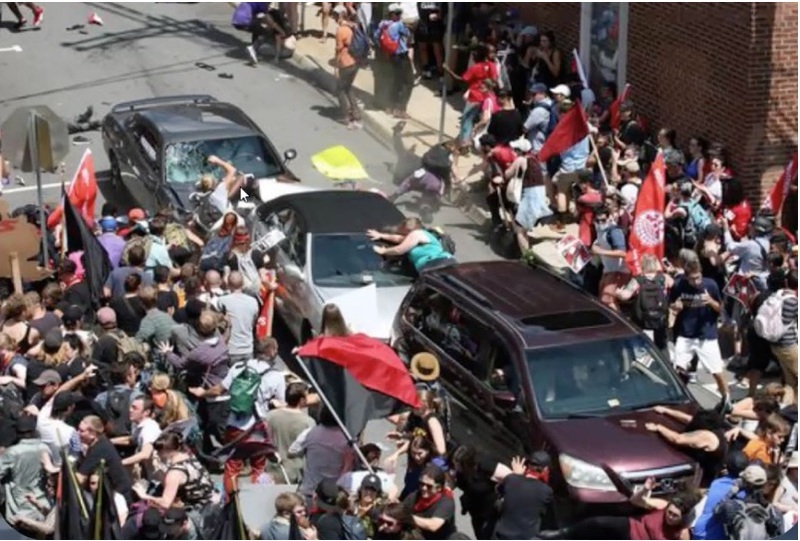 No doubt, the 220-page Independent Review of the 2017 Protest Events in Charlottesville, Virginia, conducted by Former U.S. Attorney, Timothy Heaphy, (which you can download and read yourself) sounds very plausible on its face. In its preface, it claims to have made an exhaustive effort to put together a coherent narrative of the events that took place 11-12 August 2017, Charlottesville, VA. 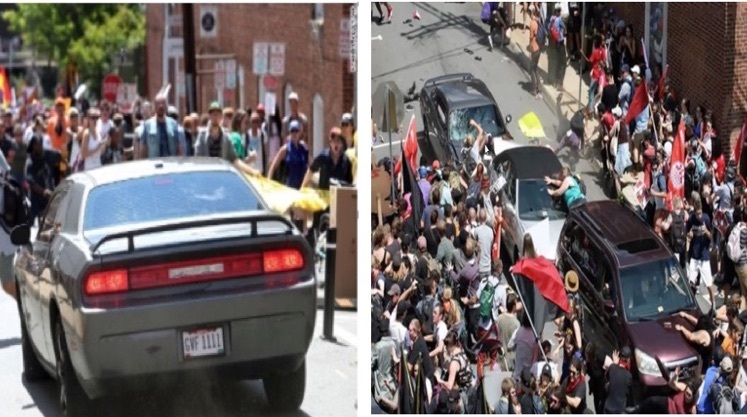 But those who had actually studied the evidence knew better, where I published a post about it, “Three Massive Blunders in the Independent Report on Charlottesville by Timothy Hephy” (5 December 2017) here on my own blog. 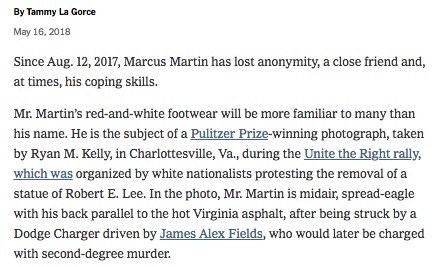 Like this new “feel good” article in The New York Times, the Heaphy Report blunders (1) in falsely identifying the driver as James Alex Fields, (2) by asserting that Heather Heyer died in the car crash (when she died of a heart attack the following day), and (3) by asserting that two UVA State Troopers were killed in the crash of their chopper, when when we have photos and videos of them walking away from the crash site, still in flight uniforms. The Times not only takes Heather’s death for granted but lauded praise upon her purported mother. 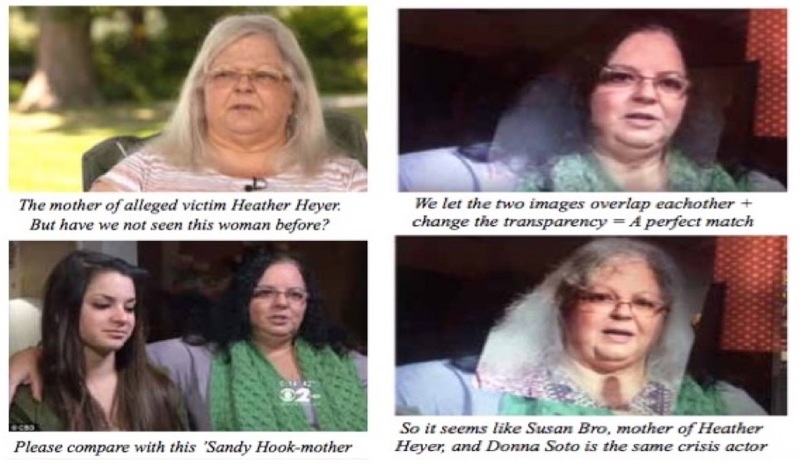 But the blunder committed by The New York Times goes far beyond the fact that Heather was not killed in the car crash (where James Alex Fields was not the responsible driver) but that Susan Bro turns out to be a crisis actor, who made her debut at Sandy Hook playing the mother of a teacher who had allegedly died there as a victim of Adam Lanza, where the entire event, like Charlottesville, was scripted–in that case, as a two-day FEMA drill presented to the public a real event. (For those who don’t know the score, watch “Sandy Hook Update”). What many may find most disgusting is that The New York Times stands as our nation’s newspaper of record, yet much of what it publishes–of which this is a sterling example–qualifies as “fake news”! Either their reporters are incompetent and don’t bother to research the stories they are publishing or–worse yet, but more likely–they know better but are vassals of The Deep State. 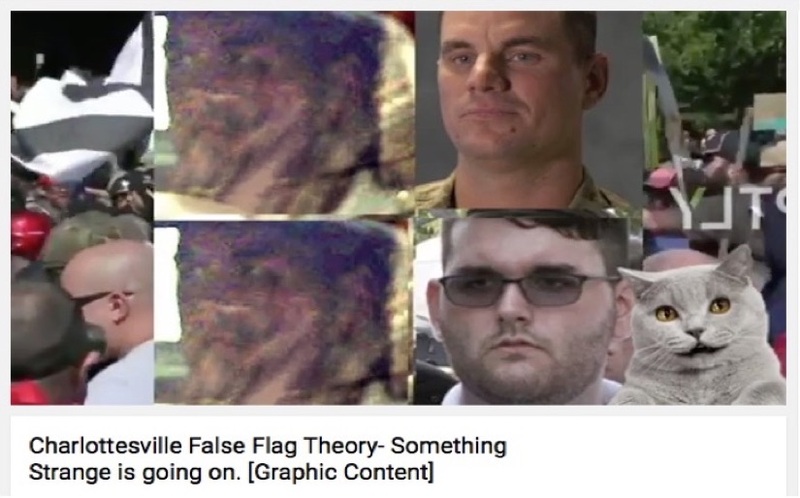 Either way, the public would be better informed by spending its time on research about “false flag” events that comes from the independent media, because what it is being told by the mainstream media–including the TV networks–is mostly false. For those who want to take a deep breath and come to grips with what we know about JFK, 9/11, Sandy Hook, the Boston bombing, Orlando and Dallas, Charlottesville, Las Vegas and Parkland, check out “False Flags on Five Fronts”, “Fake News on Five Fronts”, “How to Spot a False Flag“, “The Parkland Puzzle: How the Pieces fit Together”, “Fake News: Issues of Identity”, or–for the more adventurous–“JFK: Who was responsible and why” and “9/11: Who was responsible and why”. You might be relieved to discover that those thoughts you have been harboring all these many years actually were rooted in logic and evidence, after all. Game, Set Match. Bankers and deep state. The USA can never recover from this, and anyone who believes it can is in denial. I left Charlottesville in ’98. I had two cafes (The Roasted Bean and The Market St. Cafe) and a couple of other businesses. At that time it was a wonderful college town loaded with character. The Roasted Bean was on that exact street where this event occurred. I returned in July to house/cat sit for a dear friend. And allow me to tell you, that place changed…and not for the good. Enough high tech money came into that area to make it almost unrecognizable. Bringing up the subject of that eventful day was very definitely a conversation stopper. It was almost as if the population was harboring guilt. In any case, one thing to note is that Heather was initially portrayed as a beautiful young blond to gain the public sympathy…a frequently used ploy. In reality, she was obese, unhealthy and about ten years older. Since she died the next day of a heart attack, it would be most difficult to blame fields for her death.There is also a slow motion video of the car “crash” that clearly shows Heather off to the side and in no way actually being struck by the Dodge. Fantastic job, as always. Thank you again Dr. Fetzer. After all this time (literally years now) wondering why the general public never seems to catch on to all the fakery surrounding them I now firmly believe that the vast majority of the people are just outright stupid. I say that as someone who only made it through the eighth grade; use your imagination. I have to admit that some of these events are cleverly executed, but a lot of them are very sloppy. And the population is exposed again and again, sometimes on a weekly basis, to stupid events such as the subject one and just like the good people at UVA, they don’t get it. Or maybe they are even dimmer than I give them credit for and they do understand what’s going on but refuse to lift a finger in self defense. Looks like my last attempt to comment on this article got a bit too personal, so I will edit it a bit. I lived in Charlottesville for twenty years and know it well. I actually had a cafe on that exact street where the “accident” happened. 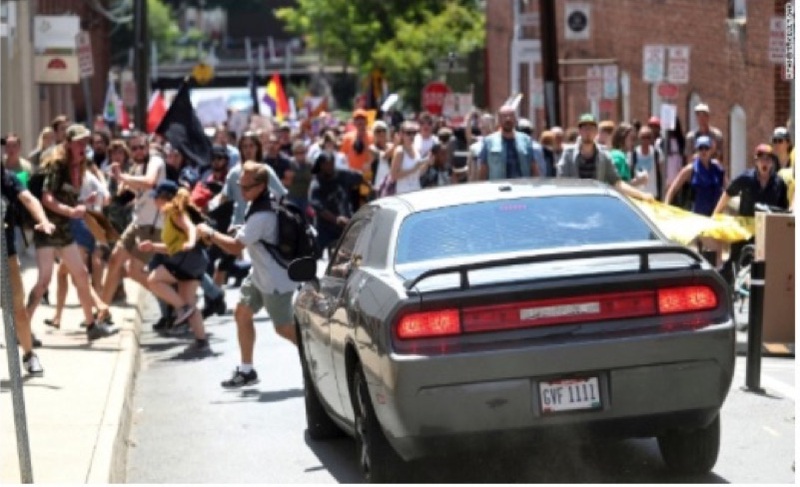 To the best of my knowledge (and I am sure this must be in Jim’s book), Heather Heyer died the following day of a heart attack and was not hit by that vehicle. The Heather initially portrayed in the media as a young blond was not the Heather that supposedly died that day. It was a woman ten years older, obese and unhealthy.